As the strange weather patterns for southern Nevada continued, I was looking for an opening to try my new Outlaw Escape on the reservoirs of Wayne Kirch Wildlife Management Area. The winds are usually the problem there as a float tube is a must to effectively fish Wayne Kirch, and kick-paddling a tube in fifteen mph winds is an unhappy chore. Finally I saw a break in the windy weather, but it brought with it one of the warmest April Fools days we’ve seen for a while. That meant light waders and shirt-only fishing. My friend John accompanied me on this trip. It is good to have company, especially someone who shares both my interest of the outdoors and my Christian faith. God is good all the time, and it is good to share that comforting truth with a friend, even when our lives cross at a time when we are experiencing hardships of the sorts that test our mettle. I was thankful John and I could share the day, even if it was the “foolish” April 1st day. John and I both caught trout pretty shortly after getting out to the open water. My first was about fifteen or sixteen inches. It was vibrantly colored. I fumbled the picture taking because I did not have a stripping apron on the Escape (I have one on order). While trying to get the netted trout on my lap and then grab for my camera the trout flipped out into the water. I crunch down all my barbs to make releasing of fish easy and as painless as possible, and the hook simply slipped out and the trout was gone in the depths of the green water. As the day wore on I got better at handling everything without the stripping apron, except for the line management. The seven weight fast sinking line was always quickly sinking between my legs, often entangling with my boots and fins… a little aggravating for me. I, too, was getting to know my Outlaw Escape. The integrated oar system was real handy in the wind, and it allowed me to cover quite a bit of water through the day. Over my six hours on the water I landed about twelve trout and one largemouth bass (fishing was slower than I expected). Three of the trout were in the fifteen to sixteen inch range, and the largemouth was about fifteen inches, the largest bucket-mouth I’ve ever caught on a fly rod. All the other fish seemed to be recently stocked and fell into that ten to twelve inch range. I headed to the dock area about 5:00 PM; John proclaimed me to be the last one off the reservoir (there were several boaters and other tubers when we arrived but they had already departed; thank goodness Haymeadow Reservoir is large so we could still experience a sense of seclusion). God is good, all the time, even on April Fools. Where is cold springs? 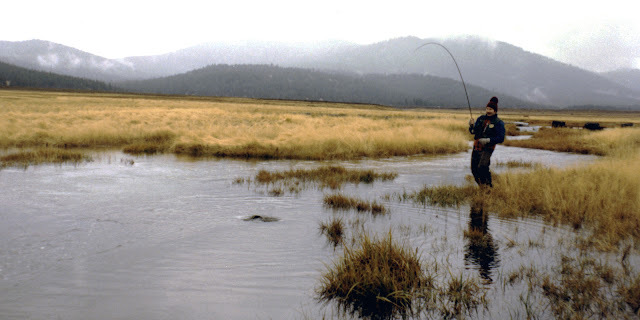 Is haymeadow or cold springs better for trout fishing? Also, which one is better for bass fishing? You can use “NV Dept of Wildlife – Fishing” link I supplied under “Other Web Sites of Interest” located on the right side of my page. More directly you can cut and paste this link (http://www.ndow.org/fish/where/waters/south.shtm ) to see the Angler Guides for Southern Nevada. Then you can click on the individually numbered waters on the map and receive all kinds of helpful information, including the information you are seeking above. If you still have trouble let me know and I can assist further. Thanks. I looked at the site but couldn't find where cold springs is. Is before or after hay meadow? Between haymeadow and cold springs which one do you have more luck at?? As you are heading north on Highway 318 you’ll take the first dirt road marked Wayne Kirch Wildlife Management Area (there is a second turn-off five to ten miles later, but that’s right at Sunnyside). That dirt road will take you right to the Adams-McGill reservoir were all the major WK-WMA signage exists. From there you will turn left (downstream if you will) where you’ll come across a sign to turn off for Cold Springs and then another sign farther down to turn off for Haymeadow. The signage is very clear and visibility of the reservoirs from the main road is good. Adams-McGill might be the better bass fishery. Both Cold Springs and Haymeadow hold rainbow trout and largemouth bass. I think Cold Springs is the better trout fishery of the two. If it helps, cut and paste this link from my October 27, 2008 WK-WMA excursion (http://www.fisherdad.com/2008/10/cold-springs-haymeadow-reservoirs-wayne.html ); scroll down and you’ll see a Google Earth map of the WK-WMA with the reservoirs labeled.